My friend Jodi made these last year and they were delicious! I used an ice cream scoop to make them the same size and to give them a smooth rounded top. They kept their shape beautifully! The inside were soft and pumpkin-y (if that's a real word!). Preheat oven to 350 degrees F. Spray cookies sheets with nonstick cooking spray. Cream butter and sugar together until smooth. Add eggs one at a time and beat well. Add vanilla and pumpkin until well blended. Combine the flour, baking soda, baking powder, salt, spices; then stir into the pumpkin mixture. Mix in the chocolate chips. Scoop onto cookie sheets and bake 12-15 minutes until edges are golden and puffed. Looks yummy! I may try these but decrease the butter amount. 1 cup seems like a lot with the pumpkin and choc chips in them. Thanks for sharing this! Yum! These cookies will be great, this fall season. Thanks for the recipe and linking to TMTT. You had me at Pumpkin!! These look great, can't wait to try them. Oh yum! I'm so glad it's pumpkin season again! These cookies are so puffy. They look beautiful. Add the chocolate chips and you have it sold. That is a great idea. Thanks for doing it and linking to MMM. These look huge! I thought they were muffins at first! They sound delicious though! They sound delicious! I can bet they wouldn't last long in our house! MMmmmmmm... I love anything Pumpkin! Wow, these look great. We used to have a cafe here (gone now) that served beautiful pumpkin and chocolate muffins that I loved - I need to try making these as a good substitute. Wow!! That is one big cookie...which, of course, calls for one big glass of milk. Thanks for sharing this recipe. It looks delicious. Oh, soft and pumpkiny is good!! These look and sound great...perfect for fall. Thank you for sharing them with the hearth and soul hop this week! Delicious! 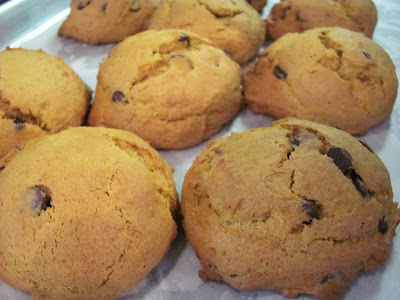 I love pumpkin flavor and these look like a fabulous new way for me to use pumpkin! Thanks for sharing! Yummy! I love pumpkin and I haven't tried out this recipe yet. Thanks for linking up and sharing. I look forward to trying it. Have a great day!